The coming of Spring is the best time to get an oil change. Cars experience a lot of problems due to the change of seasons. When the temperature rises from the Winter cold to warmer Spring weather, cars can change too. Coming in for an after winter tune-up may just help you get through the summer. One checkup from us will keep your engine purring and you safe on the roads while driving this Spring. There are many problems that come with Winter. There are more potholes in the roads, which means tire problems, and excessive ice in Michigan can lead to brake problems. When you come into Mr. Muffler for your oil change and all fluids inspection we can perform other important checks. We will give you a full brake inspection and tire rotation to ensure your driving safety. We even have a 21 point inspection to keep your car running smoothly through the turn of the seasons. And there’s more. When you come into the Mr. Muffler shop, we’ll check your battery, car belts, fluids levels, and filters just to name a few. Tires are very important and as we mentioned they may be worn from driving on bad pavement, getting unstuck and changes in air pressure. Ask us about the tires we sell, we can hook you up with a new set at very competitive prices, do the alignment and send you on your way in short order. Check out our current coupon offers for additional savings. Regular tune ups are even more essential when you have an older car. Older cars don’t always have the technology to let you know what’s wrong with the car. You have to be extra vigilant when looking for problems. 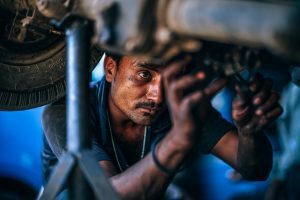 You may notice things that are under-performing, whether that be your gas mileage, brake squeaks, or a loud noise coming from the engine or exhaust. Don’t leave these things to chance, or you might damage your car. Get your car checked out or inspected at Mr. Muffler in Westland. Please Contact us with any questions today! So now that you have the scoop on the importance of having your car inspected, let’s get back to the oil change. Westland, Inkster and Canton residents find our shop on the corner of Cherry Hill and Wayne very convenient. We continuously run specials on oil changes, including full synthetic oil.